While calcium and phosphorus are often considered the most important minerals among organic and biological gardeners and farmers, we know it’s not that simple. 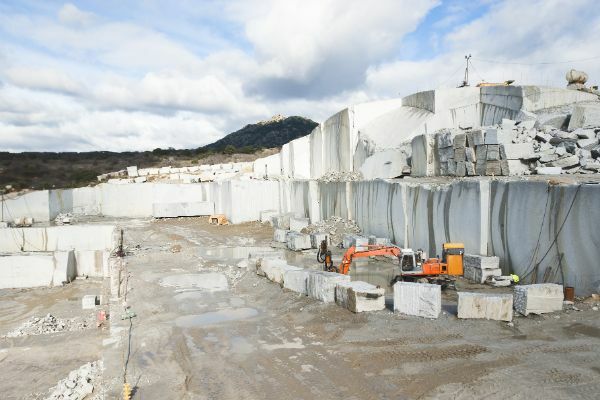 A granite quarry in Madrid province, Spain. All nutrients need to be there in sufficient quantities and proper ratios for optimal health. Still, there are only a handful we focus on as being the foundational nutrients, with the rest supplied mostly through things like compost, sea minerals and rock dust. Rock dust is one product everyone can use without a soil test. In my opinion, a good quality dust is one of the most important mineral soil amendments. The best dusts contain an abundance of major and minor minerals that can be applied to the soil and used by microbes and plants. You may be able to find a good dust locally from a quarry for a very low cost, or you may have to buy it at a garden center or other fertilizer supply store where the cost is $20 to $40 for 50 pounds. Minerals from land slowly make their way into rivers, lakes, and eventually, the oceans. Periods of glaciation, volcanoes and other natural events contribute to the process called remineralization. 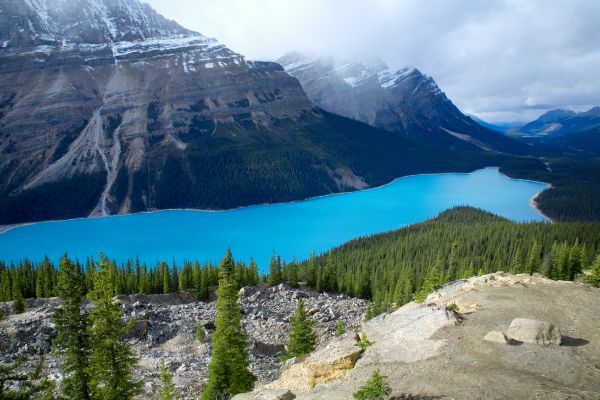 Ultra-fine rock dust particles from glaciers grinding over stone are what give glacial lakes their intense turquoise color, as they reflect light from the sky. In the last century, our agricultural practices and general intervention in the planet’s natural systems has greatly accelerated the loss of minerals to the point where our soils are depleted. We can do the same work of a glacier in order to get some minerals back in the soil by using rock dust. Rock dust is a fine powder, the best type coming from glacial or volcanic rocks such as basalt and granite. Research on its benefits has been done for at least 60 years. The dust often contains a wide array of minerals, particularly if it’s from a glacial source that has a mixture of many different kinds of rocks. Rock dusts have produced amazing results, such as doubling yield and vastly increasing nutrition in vegetables. Vegetables grown with rock dust are bigger, tastier, and much more nutritious. In one experiment, iodine in spinach was 1,600 parts per billion on conventional soil, versus 640,000 on soil that had been remineralized with rock dust. Remineralize the Earth is an organization doing a lot of research. They recommend between 150 and 500 pounds per 1,000 square feet. Still, good results have been seen with less than five pounds per 1,000 square feet with certain dusts. It can be applied in any way that gets it onto the ground, whether it be by hand, with a shovel, or with a spreader. Incidentally, if you’re composting, it’s even better to put the rock dust in there rather than straight onto the ground because it will have a chance to get integrated and chelated with the organic matter. When composting, Phil Callahan, author of Paramagnetism and Tuning In To Nature recommends 40 to 50 pounds per cubic yard, while Remineralize The Earth recommends using 2 to 20 pounds. More important than how you use it is that you use it. Magnesium helps give structure to soil. That’s why we need a little more of it on sandy soils as compared to clay soils, to help that sand glue together a little better. Too much magnesium in relation to calcium causes soil compaction, a common occurrence. Magnesium also regulates nitrogen in the plant and helps transport phosphorus, so deficiencies in these nutrients may have to do with excess magnesium. See how intertwined all of these nutrients are! It’s difficult to isolate them as each having their own tasks because they all work together. Magnesium is at the center of the chlorophyll molecule, which is responsible for photosynthesis. Interestingly, the chlorophyll molecule is almost the same as the molecule that makes up our red blood cells, except that blood cells have iron at the center instead of magnesium. 3-D rendering of a chlorophyll A molecule – the type that gives plants their green pigment. The big red ball at the center is magnesium. Magnesium is important for plant health, but often, when we need magnesium, we need calcium, too, which is why I use calcitic lime much more often than dolomite. We’re looking for 7-15% magnesium on a base saturation test, even up to 20% magnesium for sandy soil because the magnesium helps give it more structure. The plant won’t take up enough magnesium if there’s too little or too much in the soil. Most of our soils have too much magnesium, which means the plant won’t take up enough, which may be why our food is so deficient in magnesium. I like to keep magnesium on the low side because magnesium ties up nitrogen, and I don’t apply much nitrogen. That being said, some people have success keeping magnesium levels higher. If your calcium to magnesium ratio is low, though, you’re probably going to have nitrogen deficiency problems, compaction, and grassy weeds. Langbeinite is approximately 27% sulfur, 22% potassium and 11% magnesium. It’s also known as sul-po-mag or K-mag, and is a good, natural product that is useful if a soil test indicates you need sulfur, potassium and magnesium. It’s a bit pricey at $30 to $40 for 50 pounds, but Dr. Reams liked it a lot and wanted it to be applied in mid to late summer. It can be difficult to find and most people will look at you like you just zoomed in from Mars if you ask for langbeinite. They may have heard of sul-po-mag or K-mag, but they may substitute a synthetic version so be sure to ask for organic. Another source of magnesium is epsom salts, also known as magnesium sulfate. It contains approximately 16% magnesium and 14% sulfur and costs about $10 for a few pounds. 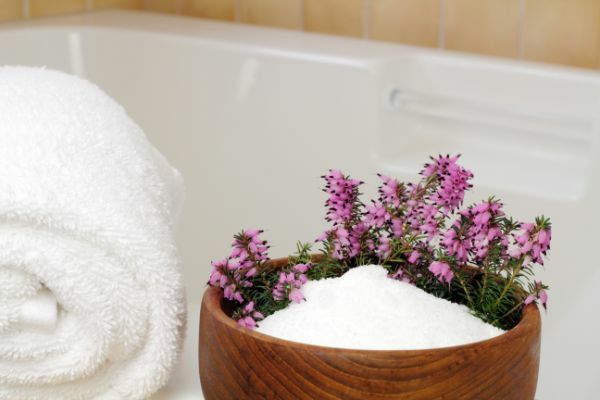 Yup, your garden can use the exact same epsom salts as you put in your bath… though they’ll be cheaper if you buy them in bulk than in a little sachet with flowers. It can be used as a foliar spray or on the ground when you know you need magnesium and sulfur. Potassium is involved in many plant processes, but extra potassium is not needed in the soil of most home or market gardeners who are using compost and mulch. Everywhere I’ve lived, I’ve had to worry more about getting the phosphorus up in relation to potassium, so I haven’t wanted to add too much extra potassium. It is important, though, for determining the caliber of the stalk and leaves and the size and set of the fruit, among other things. Compost made with lots of green matter and a bit of manure generally provides plenty of potassium. Traditionally, we go for 2-5% potassium on a base saturation test. More recently, some consultants advocate the upper end of the 2-5% range in order to ensure we have more potassium than nitrogen in a plant tissue test. Of course, most of us don’t do plant tissue testing, but just knowing that we should try to move the potassium towards 5% and not over-apply nitrogen is helpful. On the other hand, too much potassium compacts the soil. Langbeinite supplies potassium and was mentioned in the magnesium section. If my soil had a potassium deficiency, I might also use some seaweed if I could get my hands on it, as well as granite dust and ash. 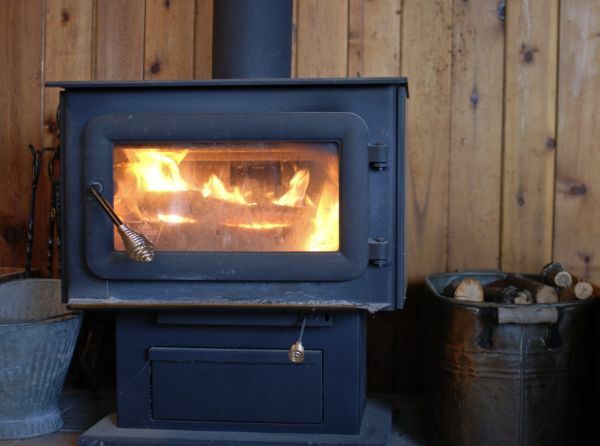 Granite dust is 3-5% potassium, while wood ash can have a potassium content as high as 10%. Finally, something to do with the ashes from your stove! …if you know you need Potassium, that is. Greensand is a sandstone with approximately 7% potash and a fair amount of iron and silica, as well as a very broad spectrum of trace elements. Although the potassium is tightly held and slowly released, I like greensand because of the benefit of the silica and trace minerals that come with it, although it is a bit pricey at $25-$40 for 50 pounds. It’s high in iron, so you don’t want to use it if a soil test says you already have too much iron. You must have an active soil food web to make available the potassium in greensand, and in granite dust and ash for that matter. Greensand is seen in many organic fertilizer blends and is a common suggestion for homemade fertilizers, but I feel it’s not something that should be added indiscriminately because you probably don’t want the additional potassium. Potassium sulfate is white salt. It’s expensive, but you only need two pounds per 1,000 square feet when potassium is low on a soil test, unless you’re growing a big crop of plants with high potassium needs, like potatoes or pumpkins, in which case you might double or triple that. A 50-pound bag costs $40-$50, but you might be able to find five pounds for $15 or less. I don’t recommend the chemical potassium sulfate that’s made by reacting potassium chloride with sulfuric acid. Also, don’t get this confused with muriate of potash (potassium chloride, 0-0-60) which is mostly potassium and chlorine, and is one of the most detrimental fertilizers in use today. Muriate of Potash – this is a pretty picture, but what it does to soil life isn’t so pretty. We don’t ever want to be adding this much chlorine to our soil because it kills soil life. Sulfur is important, and lacking in many soils, which is one reason why gypsum is often recommended along with calcitic lime. Like nitrogen, sulfur is a major component of protein, and its presence helps nitrogen to be used more efficiently. Sulfate can enhance calcium availability and is used by plants in several ways. Gypsum, discussed in the calcium lesson, is the way to go for organics. I don’t tend to use elemental sulfur because it can create sulfuric acid, tie up calcium and cause your fruit to rot at maturity, but some people use it successfully. Langbeinite, potassium sulfate and epsom salts, all discussed previously, contain sulfur, too. Sulfur bonds to excess cations and leaches them, provided there is sufficient calcium. It will bind with calcium, magnesium, potassium and sodium, and then water will leach some of it down. I use an appropriate form of sulfur when a soil test indicates I have too much of one of the cations. Using the right form of sulfur helps to kick the calcium, magnesium, potassium and sodium toward their appropriate numbers. The form of sulfur you add depends on which cation is in excess. If calcium is low and magnesium is high, gypsum (calcium sulfate) is often included in a fertility program, often at 10 pounds per 1,000 square feet. 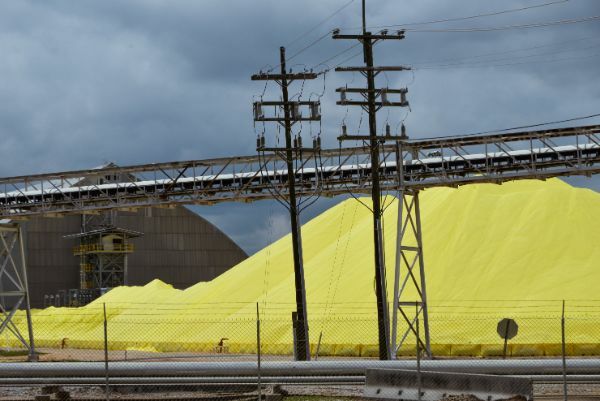 Elemental sulfur, which I don’t recommend, is also called “flowers of sulfur,” and is one of the most intensely-colored things you’ll ever see a big pile of. If calcium is high and magnesium is low, epsom salts (magnesium sulfate) would be added. If calcium or magnesium is high and potassium is low, potassium sulfate would be added. If sodium is high, choose the best for your situation from any of the above. Sodium is needed in small amounts, between 20-70 ppm. Below this, there may not be enough energy in the soil to grow a good plant. Above this, there’s too much energy, which also causes problems. Also, sodium above 70 ppm will generally cause soil compaction, even if the calcium to magnesium ratio is perfect. Gypsum is often used when sodium is too high, to bring it down. I use sea salt from the bulk store to raise sodium when it’s low. Lastly, we come to nitrogen. It’s the basis for all amino acids and proteins in our bodies and the bodies of all living things. Interestingly, while the air is 78% nitrogen, we can’t get nitrogen directly from the air and neither can plants. Luckily, certain microbes can. While rainfall and lightning bring some of this nitrogen down into the soil, nitrogen-fixing bacteria and actinomycetes provide most of it. As we’ve seen, they take nitrogen out of the air and convert it into other forms of nitrogen they can use and plants can use. 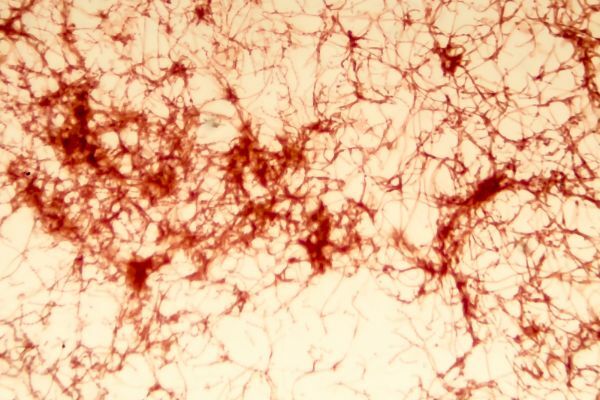 Actinomycetes, bacteria that have hyphae like fungi, are important members of the soil food web. Nitrogen exists in many different molecules, generally combined with hydrogen or oxygen. While plants take up complex nitrogenous proteins and amino acids, the two main forms they use are the relatively simple ammonium (NH4+) and nitrate (NO3-). Most food plants use ammonium in small amounts, especially towards the fruiting and flowering stage. It’s mainly produced when microbes decompose organic matter such as leaves. 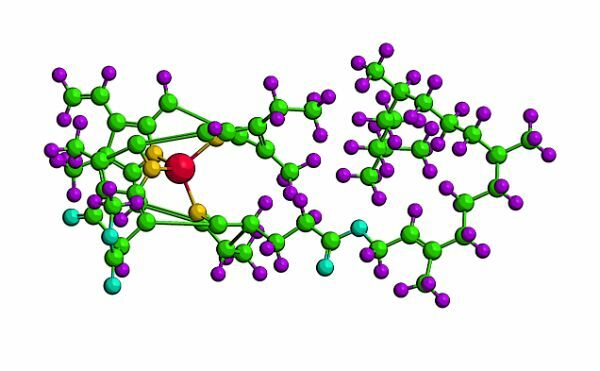 Since ammonium has a positive charge, it’s held on cation exchange sites, although relatively weakly. Some of the soil ammonium is converted to nitrite (NO2-) and then nitrate (NO3-) by different groups of bacteria. The hydrogen coming out of this process kicks cations off the exchange sites. We don’t want too much of that to happen at once, so we don’t want to add too much nitrogen at once. If the soil is dominated by fungi, much of this ammonium won’t get converted to nitrate. This is great if you’re trying to grow perennials, trees and shrubs, which prefer more ammonium. If you’re trying to grow annual vegetables and grasses, they mostly want a soil dominated by bacteria, and consequently more nitrate. Nitrate is the main form most crop plants use and this is what certain microbes manufacture from other forms of nitrogen. 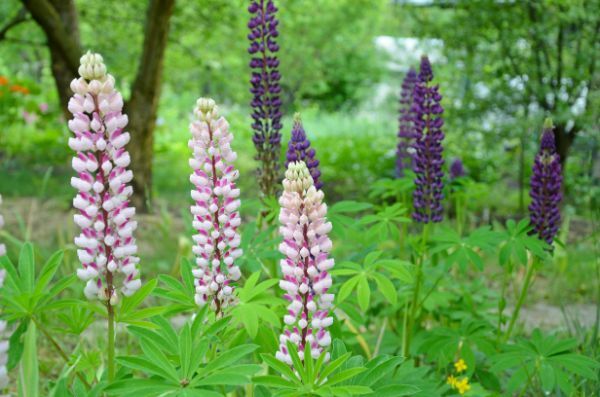 Lupines are a “nitrogen fixing plant” – meaning they host nitrogen fixing bacteria in their root nodules. Most of this work happens during the growing season as temperatures get warmer, just when plants need more nitrogen. This is good because nitrate would leach away very quickly if the microbes made too much. A lot of nitrate nitrogen leaches away after application of chemical nitrogen, or also with the application of too much fresh manure. Nature knows the right amount to make available, but to get the best crop, it’s often necessary to supplement some nitrogen. But chemical nitrogen fertilizers are overused in conventional gardening and agriculture, especially early in spring before the microbes are ready to use the nitrogen. This is when it leaches down through the soil to pollute the groundwater and consequently isn’t available for the last few weeks before the fall harvest. While nitrogen fertilizers are often overused, it doesn’t mean we shouldn’t be thinking about how to supply sufficient nitrogen to the soil and microbes. Nitrogen in the soil is like the electrolyte in a battery. We need enough to provide energy to the soil to get everything else working. Like phosphate, nitrogen also transports nutrients throughout the plant, especially when phosphate is short. Liquid fish is a good nitrogen source. It doesn’t provide a huge amount of nitrogen, but it’s good quality and definitely helps build proteins and amino acids. Most legumes contribute nitrogen to the soil. I use as many as 25% leguminous plants in a new garden design in order to ensure the nitrogen needs of the soil food web and plants. 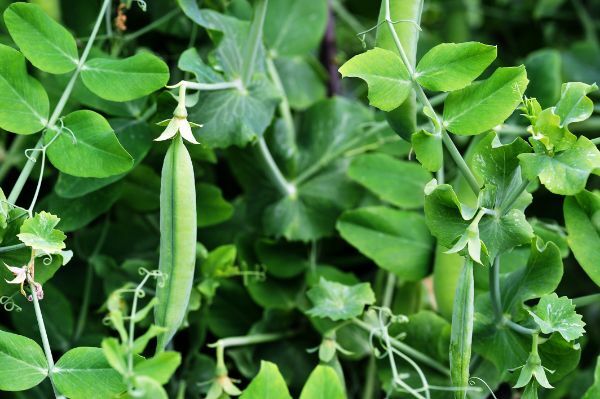 You can’t beat snap peas for delicious garden snacking. You probably need to inoculate your legumes with Rhizobia, and your soil has to be healthy enough to support them. Otherwise, they won’t hang around, so be sure to work on the nutrient levels, too. Manure should be composted first. It’s great to get different sources, but rabbit, chicken and horse manure are the highest in nitrogen. Compost also supplies nitrogen. It’s the manure, food scraps and fresh plant residue that contribute most of this to the pile. Applying 1/2 yard (1/6 inch) of compost per 1,000 square feet each year will give you a lot of nitrogen as well as phosphorus and potassium, slowly released by microbes. You really need look no further than good compost for much of your nitrogen needs. Dean Craine of AgriEnergy Resources in Princeton, Illinois says an increase in soil organic matter of 1% to a depth of 40 inches brings 45 pounds of nitrogen per thousand square feet. I’m not sure how he did his math, but it’s a good example of how important it is for us to focus on our organic matter. This kind of nitrogen doesn’t all show up on a soil test because it’s bound up in organic molecules, not free in the soil as nitrate and ammonium. My understanding of Chilean nitrate is that it’s sodium nitrate, derived from bat manure (guano) deposits in Chile. 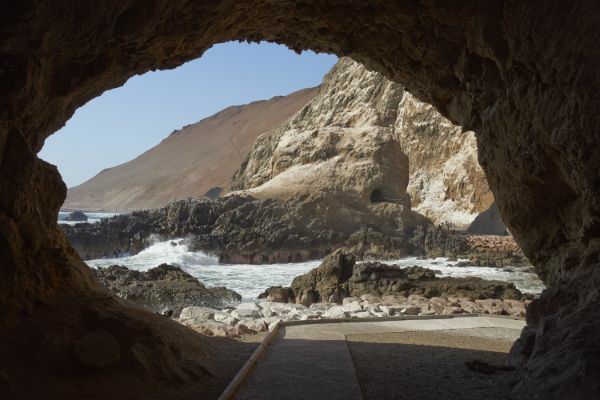 Anzota Caves at Arica on the coast of Chile used to be mined for their guano deposits. It’s allowed under some organic standards in the U.S. and Chile but isn’t allowed in Canada and most other countries partially because of environmental degradation associated with mining the product and also because of concerns over the leaching of the soluble nitrate into the groundwater. Some organic proponents endorse it and others don’t, but it is OMRI listed. It’s rather expensive and high in nitrogen (16%) and sodium (26%), so it can negatively impact the soil food web and waterways. I’ve never used it and so can’t comment much, but I wanted to include it here because you may hear of it. A good quality rock dust is one of the best fertilizers because it contains a broad range of minerals that will slowly become available over a number of years. It’s generally more important to increase calcium than magnesium, but the latter can be supplied by dolomite lime, langbeinite and epsom salts in order to get at least a 7:1 calcium to magnesium ratio. If we’re composting, we should have enough potassium, which can also be supplied by greensand and potassium sulfate to aim for a 2:1 phosphate to potash ratio. 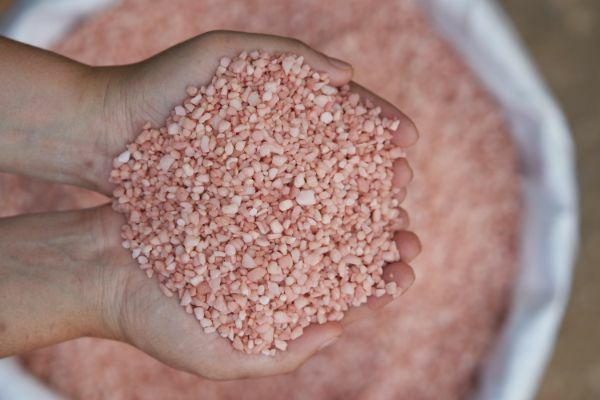 The potash to sulfate ratio should be 1:1 and sulfur can be supplied with gypsum, langbeinite, potassium sulfate and epsom salts. Nitrogen is easily supplied with compost, legume cover crops and fish fertilizer.